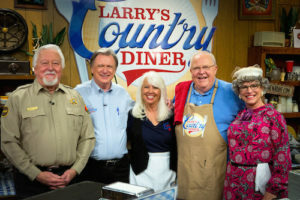 NASHVILLE, Tenn. (June 21, 2018) — Gabriel Communications’ popular, improvisational variety show, “Larry’s Country Diner,” will celebrate 10 successful years on television at its upcoming television tapings August 6 – 7 at Ray Steven’s CabaRay Showroom (5724 River Road) in Nashville. Over the past decade, the down-home, family-friendly show featuring legendary musical guests and cast members (proprietor Larry Black, emcee Keith Bilbrey, sheriff Jimmy Capps, church gossip Nadine, Renae the waitress) has cultivated over two million loyal viewers monthly worldwide via RFD-TV, Roku, Apple TV, Amazon Fire and CountryRoad.TV, and has given rise to a robust DVD and merchandise franchise. Fans who attend the celebration taping will be treated to two show tapings (and two celebrity music guests) for the price of one show, with options for meal service and seating. Tickets start at $59 (General Admission), $79 (Floor Seating & Dinner), and $99 (Diner Set/On Stage Seating & Dinner). To purchase tickets, please visit: raystevenscabaray.com. Since nearly the inception of the show, the waiting list to get a seat at the Diner as part of the studio audience has been a multi-year proposition. To resolve this issue, the show has partnered with the newly-opened 700+ seat, Vegas-style venue, Ray Stevens CabaRay Showroom in Nashville.